HPMG the Physicians of Kaiser Permanente is Hawaii’s largest and most diverse medical group with over 500 doctors and 60-plus specialties, led by physicians and providers dedicated to ensuring every Kaiser Permanente member receives the best care possible. HPMG physicians and providers need ways to share their achievements in excellence, compassion and innovation while consistently attracting and recruiting the best physicians nation-wide. We partnered with HPMG/Kaiser Permanente to embark on a dedicated branding, communications and recruitment campaign that included a mix of videos, content development and interactive. 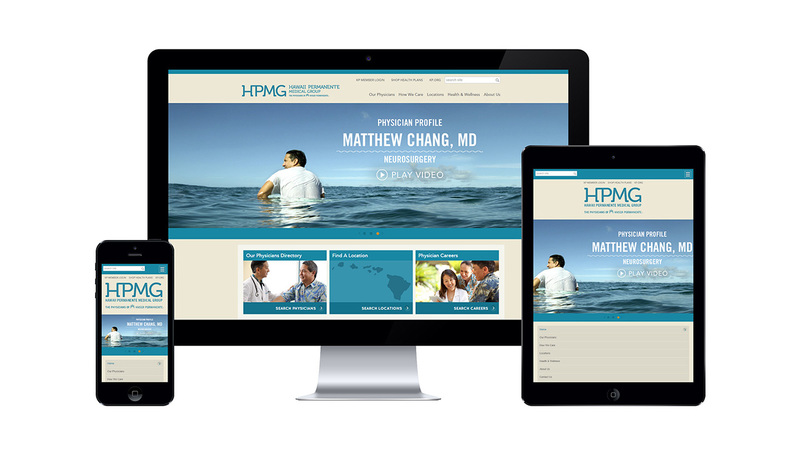 In collaboration with HPMG, video projects and content-rich websites were developed to bring awareness to the public about the commitment to leading and delivery world-class care, while recruiting the best care-providers in the nation. HPMG/Kaiser Permanente has ranked as the number one health plan in Hawaii and is among the top 25 nationwide, according to the National Committee for Quality Assurance’s 2013-2014 report. Through rigorous processes, HPMG continues to recruit the best doctors nation-wide. Key performance indicators relating to quality of care and member satisfaction show persistent success in meeting and exceeding goals, supporting HPMG’s mission to lead and deliver world-class care.